When I think about chocolate cake, I want the cake layers to be moist. I want them to be packed with chocolatey flavor, and to have a soft texture. The baker in me also wants the cake layers to have structure, so that they don’t fall apart as you try to frost them. I also wanted a chocolate cake recipe that could be carved for sculpted cakes! That’s how this recipe came to be. I had been playing around with different chocolate cake recipes for years, and they all were delicious. Each recipe had some of these attributes, but none of them had it all. Was it greedy to demand so many things from one chocolate cake recipe?? No. We deserve it! 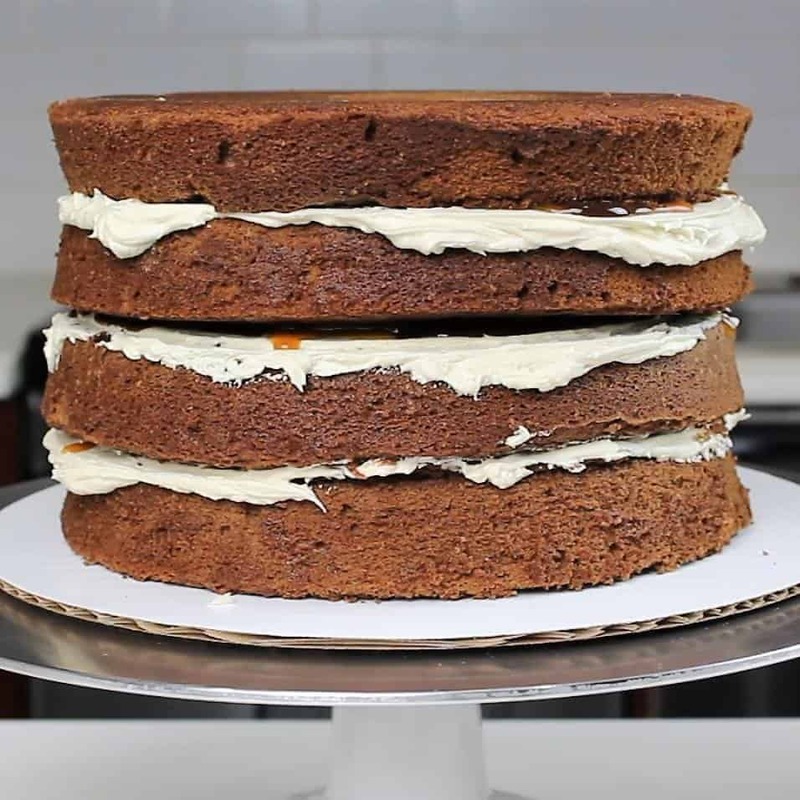 If we’re going to take the time to make a cake recipe from scratch, we deserve to have cake layers that are moist and keep their shape (as seen below). Speaking of my past chocolate cake recipes, I’m not saying they’re not great in their own way. The first chocolate cake recipe I really fell for was my moist chocolate cake recipe. It is incredibly soft and fluffy, and I love the way it tastes!! It’s a great recipe for beginning bakers, and is really easy to make. My moist chocolate cake recipe actually can be made in one bowl, AND can be made without a hand mixer!! Talk about the perfect starter recipe, right? The only downside is that it isn’t the easiest to stack and frost with perfectly smooth sides! When I was first getting into baking, taste was my #1 priority, so this didn’t bother me much. As I became more interested in cake decoration, I was obsessed with frosting cakes with smooth sides. It was so much easier to frost cake layers that had a bit more structure, like my favorite vanilla layer cake recipe. I fell in love with the strength of the layers, and how well they help up while being frosted. I altered the recipe to a make a chocolate version, and used this as my chocolate layer cake recipe for a while. The only downside is that I like to trim my layers to remove the caramelization on the sides. This means an extra step in the process, and I wasn’t completely satisfied with the texture of the layers. This lead me to continue to try out new chocolate cake recipes, and experiment. I really loved using Yolanda Gampp’s chocolate sponge cake recipe, but didn’t like that they baked with such huge domes! I felt like i was cutting off 2/3 of each layer when I leveled them. However, the layers tasted great with simple syrup, and had great structure. I used Yolanda’s recipe as the starting point, then combined my favorite elements from all my past chocolate cake recipes. The other element I really wanted to change was the size of the domes on top of each cake layer. While creating this recipe, I chose to use black cocoa instead of regular baking cocoa. I love the taste and color it creates!! You can see what a beautiful color the black cocoa adds to the cake layers by looking at this slice of my raspberry chocolate cake. I also swapped some of the water for buttermilk to add more moisture, and used less baking soda. The result?? A soft, tender chocolate cake that doesn’t need simple syrup, and that holds its shape well while being frosted and stacked. I’m obsessed with this recipe, and hope you all will be too! If you don’t have access to black cocoa or don’t want to buy it, you can also use regular baking cocoa in this recipe! That’s exactly what I did in my triple chocolate wrap cake below, and it was delicious. You can add a splash of simple syrup if you love using it, or think that the cake layers will be exposed to air for long period of time. I highly recommend adding simple syrup if you’re making a carved cake or a wedding cake! 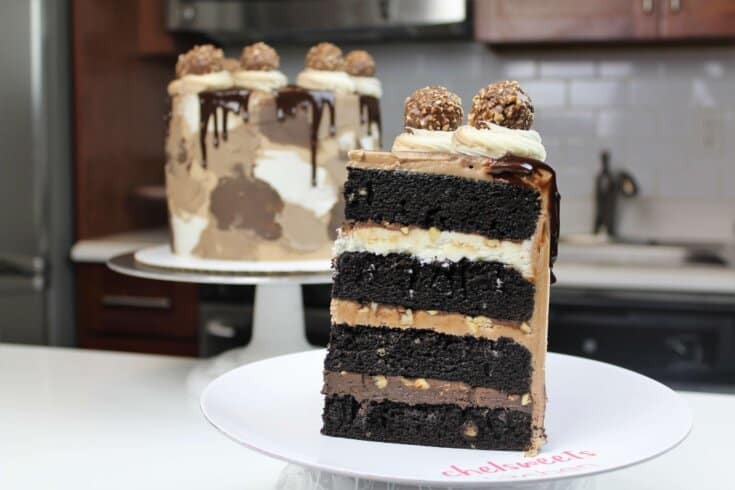 If you try this chocolate layer cake recipe, please tag me @chelsweets, and use the #chelsweets, so I can see your beautiful creations!! 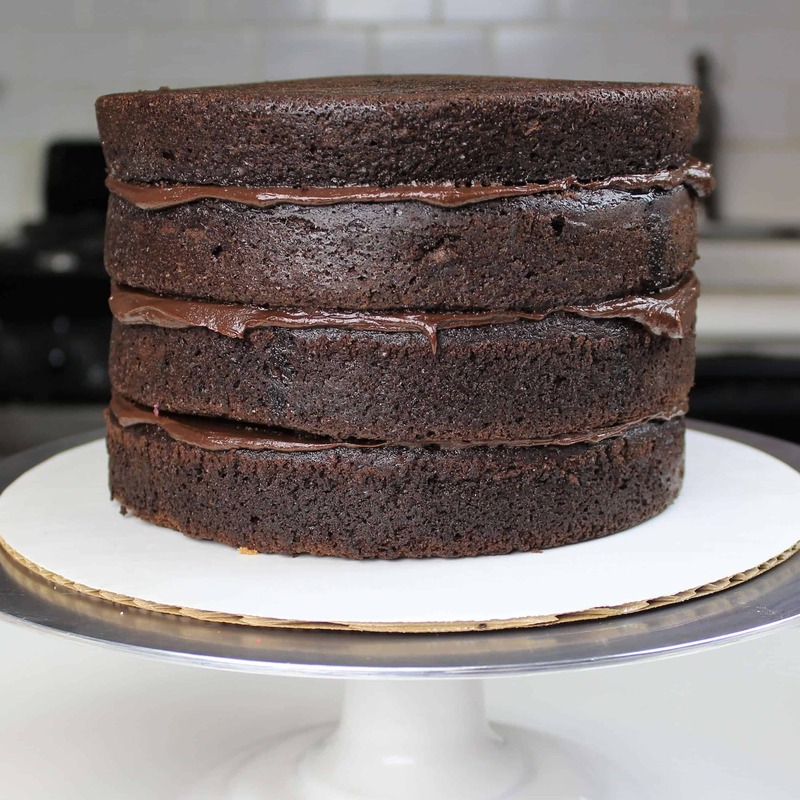 This is my go-to chocolate layer cake recipe! It makes soft, tender, chocolaty cake layers that can handle a splash of simple syrup, and still hold up while being frosted. Begin by preheating the oven to 350 degrees Fahrenheit. Line four seven-inch or three eight 8-inch pans with parchment rounds, and spray with non-stick spray. Add the sugar and butter into the bowl of a stand mixer, and mix on high for 1 minute with a whisk attachment. The mixture should become light in color. In a separate bowl, combine the cup of hot water, and cup of buttermilk. Pour in the cup of black cocoa, and whisk until no clumps remain. Next, add 1 cup of flour into the butter/egg mixture. Scrape the sides of the bowl with a spatula, to ensure the flour is fully incorporated. Mix in the 2nd cup of flour, at a low speed. Pour in the remaining buttermilk/cocoa mixture, and again gently pulse, then mix on low until fully combined. Add in the last cup of flour, and mix on low until the flour is incorporated. Mix on high for 30 additional seconds, to incorporate a bit more air into the batter. Evenly divide between the prepared pans. I like to use a kitchen scale to ensure each pan has exactly the same amount of batter. Bake for 32-35 minutes, or until a toothpick comes out clean. Place the pans in the freezer for about 45 minutes, to accelerate the cooling process. Once the layers are fully cooled, carefully flip the pans and remove the layers from the pans. Use a serrated knife to level the tops of the layers, and then frost as desired. While the cake layers bake and cool, make the chocolate buttercream frosting. Stir by hand with a rubber spatula for a couple minutes to get the frosting SUPER smooth. Add an even layer of chocolate buttercream between each cake layer. Add a second, thicker layer of frosting to the cake, and smooth using a bench scraper. Then decorate as desired! This buttercream can also be made in advance!! I highly recommend making it ahead of time to make the decoration of a cake less stressful and more fun. It keeps in the fridge for several weeks, if stored in an airtight container. Yumminess! Can’t wait to bake it. Thank you, Chelsey, for all you do! Hi, I just made your “new” go to chocolate cake. I do have to say, with your go to vanilla and chocolate cake recipe I loved the one bowel method. I was wondering why you add the baking powders to the butter/ egg mixture rather then the flour? it’s easier to add them straight into the bowl of my stand mixer! I add the flour straight of the bag using a measuring cup, so to me it’s just easier that way! Hi Chelsweets! Would I be able to use dark hershey’s cocoa powder or normal hershey’s cocoa in place of the black cocoa? I dont have black cocoa so i was wondering if regular unsweetened cocoa powder would work as a substitute? Also what is the difference between this chocolate cake recipe and your moist chocolate cake recipe? Besides the ingredients ? yes, it will! This recipe has slightly more structure, and is easier to stack to make layered cakes! It also can absorb simple syrup more easily. The moist cake is so soft it can’t handle simple syrup well! I’ve been looking for a good chocolate cake with structure ! And since i LOVE your best chocolate cupcake recipe, i will definetly try this one ! I was wondering, no coffee in the hot water ? Have you tried with and without it ? I have, and i add it depending on the frosting / filling I pair with it! The black cocoa I use has so much flavor though, it doesn’t realllly need it! But I do add a bit of coffee if it’s a chocolate chocolate cake, since I do love the hint of coffee in an all chocolate cake! Does this recipe make four 8 inch cakes? yes! it can be used to make 4 seven inch or 4 eight inch cake layers! Hello!! I have made Yo’s recipe twice today and both ended up falling in the center 🙁 I’m concerned It was tooo moist both times… So I hope to make yours tomorrow, espically because you add more flour. I have two 8” circle pans that are 4” deep Could I half this batter to each of them and cook 2 thick cakes then slice/level them in half? I plan to have 8 layers for a cake I’m making. Can I just adjust the baking time and bake them longer? Or will trying to make them so tall possibly be why the others fell? Thank you!! Also, I love watching your channel and congratulations on your engagement and soon to be wedding! it should end up being firm, it sounds like you may be under baking them if they’re sinking in the middle! You can make them in taller pans, but they’ll need to bake for much longer! Hi! Do I use unsalted or salted butter? Can these be baked in a quarter sheet pan? yes! just be sure to lower the temperature to 325 degrees, and bake a bit longer! I’d recommend using half the recipe to make 1 9 inch cake layer! Hi! 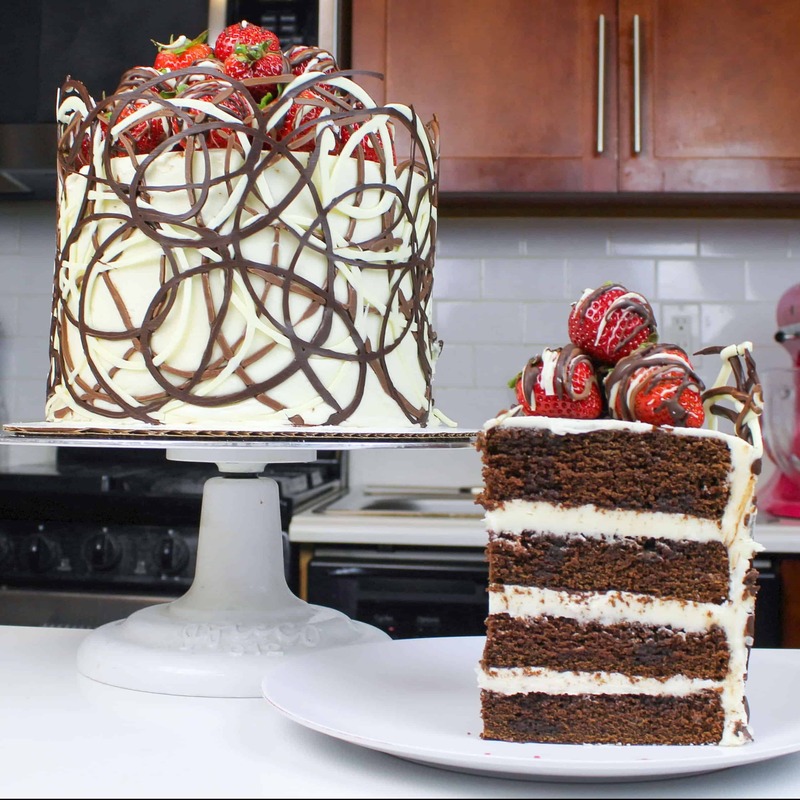 Just wondering, how much batter would I have to make if I wanted to use 10″ circle pans, but still wanted it to be as tall as the cake you made here? one batch will make about 2 10 inch layers of that height! Would you use this recipe for 6 inch rounds as well? Curious on how baking times would change! I would half the recipe to make 3 or 4 6 inch cake layers! I would bake them for 25-30 mins! Will this recipe be ok for cupcakes? If so do you know how many it will make? I wouldn’t recommend it! I have a great chocolate recipe that I highly recommend instead!! I made this cake today and as I was putting it in the oven I realized I forgot to add salt!! ? Stuff happens. It’s still not bad. But I bet it’d be great if I didn’t screw it up. haha sad! probably the best case scenario for omitting an ingredient though!! Hi Chelsea. Is there a print link for your Go To Chocolate cake anywhere. Thanks. Could I use this recipe for a naked cake? hi.. thanks for these recipes..what can i substitute to make coffee chocolate-coffee cake? LOVE all your recipes. Any idea how I could adjust this to make a 6-inch cake? I would halve the recipe, and make 3 6-inch layers! Hi! I need to make a 13″ round cake. How much of the recipe should I multiply to bake this type of cake? What is the black cocoa powder you use? I’m so excited to try this cake this weekend! I have used your vanilla cake and cupcake recipes and they are incredible! Thank you! This will forever be my go to chocolate. Cake recipe! It has turned out beautifully several times! Thanks you so much!!! Really loving your cakes! The recipes are trusted go-tos now. I made this and your white chocolate layer cake for my cousin’s 21st, alternating layers of each flavour and topping with white or milk chocolate ganache within a dam of vanilla smbc. I iced the cake with the vanilla smbc and then dripped coloured white chocolate ganache. I’ve never received so many compliments on a cake, everyone said they’ve had a lot of cakes and this was the best they’d ever had! Thank you for your wonderful recipes!! Hi! I’m looking to make this recipe in 6in pans. Would you recommend on halving the recipe? And in general, how would you advise on altering pan sizes on recipes? that’s exactly what I would recommend! I actually have a small batch recipe (which is just a half recipe), which I just added to this post to make it easier to make! I like to use it to make 3, 6 inch cake layers 🙂 They bake in 25-28 minutes. I can’t seem to find the small batch recipe for the chocolate cake on this post. Is it somewhere else? I am looking to make 3 -6 inch cakes. Thanks in advance. Love all your cakes! Sadly in the process of switching over my recipe cards to a new plugin they were lost :/ I’m hoping to have them back up soon!! Stay tuned!! Hi, I followed your instructions but used Hershey’s Special Dark cocoa and added instant coffee and vanilla. I used two 8 inch pans and baked approximately 10 min. longer…just kept checking until the tester came out clean. Once cooled I was able to easily divide each layer in half. Great structure and taste. Will consider using a flavored simple syrup with the cherry buttercream I plan to use between the layers. Next time I will try with the black cocoa, which I didn’t have enough of. I always add vanilla to chocolate….it just adds another level of flavor. Thank you so much for sharing your recipe! ? so happy to hear that!!! And happy you feel the same way about this recipe that I do!! 🙂 Thank you for sharing your feedback! Hi Chelsea,will this recipe make a 13″×9″ rectangular cake or should I half the batter? Just want to confirm that this recipe is good for a tiered cake? I am making a 3 tier cake and the bottom tier is chocolate cake. Will this recipe hold up well as the bottom tier? Dowels will be used for support. I’ve made this recipe before without putting a simple syrup on it. Do you recommend using some? My cake ended up being really dry…I think the 32 minutes was too long. But I was using a 9-inch pan? Do you think it would work ok to make 3x 9in layers of good height with this recipe? Thanks heaps for all the amazing tutorials!! they would be pretty thin!! I’d recommend only using one batch of batter to make 2 9 inch cake layers, or making a 1.5 batch! Rebecca I literally just made 3 9 inch layers… 1.5 batches of this recipe was perfect! Definitely not getting 3 layers with a single batch. thank you for sharing Wendy 🙂 and happy to hear that 1.5 batches works great for 3 9 inch pans!!! thank you so much for your recipes! I don’t see where you add the simple syrup? or is that optional? 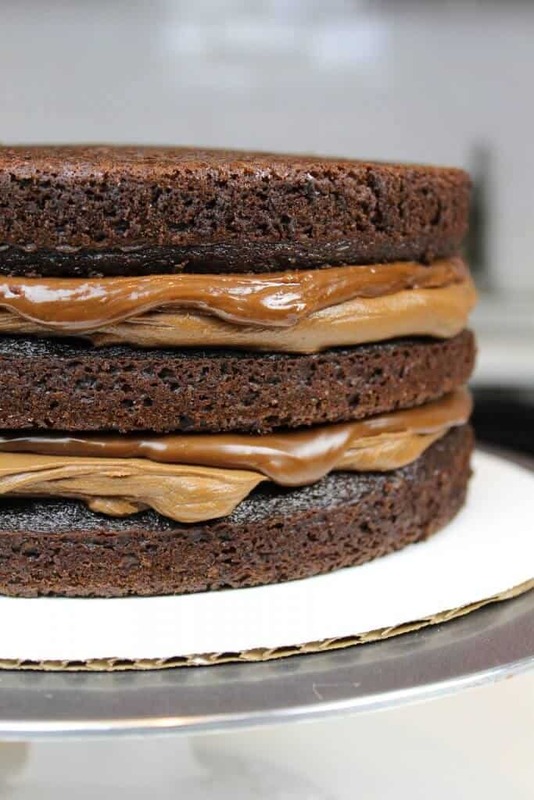 I was thinking of using this chocolate cake recipe and use the nutella buttercream fillings….will this recipe be enough for four 7 inch pans? Wow! Thank you so much! I’ve just made the small batch, divided the batter into two 6 inch pan. I kept ‘trimming’ just to eat that cake! Just couldn’t wait! Thank you so much for the recipes. Finally! The search for a perfect chocolate cake ended. Hello! I have made many cakes using your recipes. They are, hands down, the best cake recipes I’ve come across. They are always crowd pleasers and they never fail! I’m interested in making one of your chocolate cake recipes, but I’m having trouble choosing between the recipes. I’ve come across 3 of your chocolate cake recipes: “Go to Chocolate Layer Cake” “The Best Chocolate Layer Cake Recipe” “Moist Chocolate Cake Recipe.” I’m curious to know the difference in taste. Flavor is more important to me than a nice structure. In your opinion, which has the best chocolate flavor? Hello! I really want to make a 6 inch cake with 4 layers. Should I half the original recipe or use 3/4 of it? Thank you! Your recipes call for buttermilk. Can I use cultured buttermilk instead? I made your Moist Chocolate Cake recipe. Loved the flavor but it was lighter than I prefer. I really like a denser, moist cake. Would you say that this recipe would achieve that? Hi. I have tonight and tomorrow night to come up with a 21st cake for my daughter. I would like to try you go to choc cake and want to use the Wilton set of 4. 8inch by 0.75 inch high . do you think it would work and how long should I bake for? Also would I halve the recipe or use the whole recipe? Hi Denise! I’m so sorry for the delayed response on this! If the cake pans are less than an inch high, i’d be worried the cake layers might overflow as they rise up while they bake!! 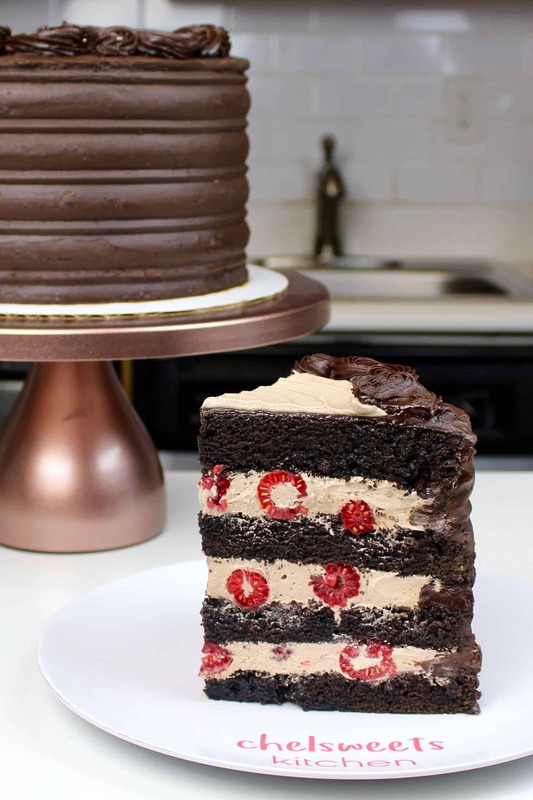 if I use that recipe to make 4, 8-inch cake layers, I usually bake them for 32-34 minutes <3 If you want to make four eight inch cake layers, you definitely need one whole batch of batter! Yup! i’ll work to have this updated soon 🙂 stay tuned!! Hi Chelsea, can i keep this cake in the freezer for a few days before i frost it? How would I use this recipe to make 3 10 in layers? Thanks!! Hi Chelsea, which size egg’s do you use? Do you use Medium eggs or Large eggs? Silly question, Is there a specific reason you say to use 4 7inch rounds or 3 8 inch rounds? Can I divide the batter between 4 8 inch rounds or does this make the layers to thin? You can definitely make 4, 8-inch layers, but they will definitely be thin, and bake more quickly! I just like slightly thicker layers, with a generous layer of frosting between them 🙂 But you can always adjust my recipe to fit your preferences!! Hi, I’m wanting to make this for my nephew’s birthday this weekend. I’ve got an 11×15 pan and I was wondering if this would be enough and what the temp and bake time would be for it? Thank you in advance! Love your work! ?? I usually use one batch of batter to make 2 9x13inch sheet cakes, so I think you can make one 11×15 inch sheet layer! It will be thick, so i’d recommend using at least 2 flower nails in the pans to help the layer bake more evenly and quickly. I’d guess it will take 40-55 minutes to bake, but I’m really not sure since I’ve never used that size of pan before. So sorry I don’t have a better answer for you! I have made this cake twice in the last two weeks! Wow! So amazing! So now I have someone asking if I could make it in a 9×13 2 layers. I figure it would be enough for that but dont know if the temp would be the same and what you would recommend as baking time. Please let me know and thank you for the amazing recipe! I’m so happy to hear that!! one batch of batter should be enough to make two 9×13 inch sheet layers! I’d recommend using two flower nails in each pan, to help them bake more evenly and quickly! The temp can stay the same, and should bake up in a similar time ( as long as you use flower nails!) 🙂 If not, it will take about 10 additional minutes to bake.